Human metabolism is composed of complex networks, and objective, reliable measures (biomarkers) are needed to guide drug developers, disease researchers and clinicians toward safe and efficacious outcomes. The combination of stable isotope labeling with sensitive mass spectrometric analytic techniques is providing increasingly important tools for drug development and clinical studies. The use of stable isotopes allows the measurement of fluxes through metabolic pathways in vivo and provides information about what is newly produced and removed within a biological system and how rapidly molecules are being synthesized and degraded in disease physiology or response to treatment. 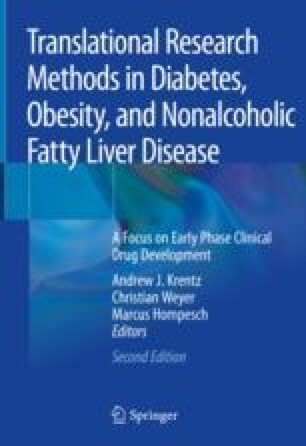 This chapter describes select examples of applications for in vivo assessment of lipid, glucose, and protein metabolic flux. The approaches described use deuterated water and other stable isotope-labeled tracers that can be used effectively in early clinical research studies to study disease pathology and drug efficacy. Waterlow JC, editor. Protein turnover [Internet]. Wallingford: CABI; 2006 [cited 2018 May 26]. Available from: http://www.cabi.org/cabebooks/ebook/20063115785.